The British Army patch measures 2 inches x 3 inches and can take the place of a flag patch on a tactical cap, UBACS shirt or MOLLE admin panel. 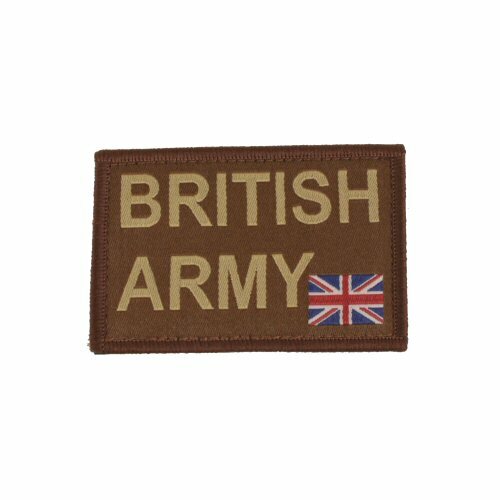 Brown coloured patch is finished with matching brown merrow edge, and the phrase, 'British Army' is woven into the patch along with a full colour flag in the bottom right corner. This is more hardwearing than full embroidery. The patch is finished on the rear with Velcro hook and loop fasteners for easy application. Clear nationality insignia with a more subtle signature than a full flag patch completes a professional and distinct appearance.